Before I start writing about the game, let me quickly introduce myself. Game development has been a big hobby of mine since 2000 and since then, I made a bunch of smaller and larger freeware RPG games (they were never translated to English, though). I also founded a Czech and Slovak RPG maker community, which functions since 2005. It’s called RPG2 Heaven, and since it’s very dear to my heart, I’m also using this name in my work (see the trailer). I’m a huge fan of J-RPG, Castlevania and NES/SNES games, so I often find inspiration for my games in them. Nightkeep is a 2D metroidvania-like platformer with RPG elements set in a fictional medieval fantasy world, accompanied by an original story. Although the game was supposed to consist of individual levels (stage 1, 2, etc), the project soon overgrew and so, the concept was changed. The game mechanics are straight from the 90s. With the change of concept, many things were changed and many of them were added, such as a back dash, a slide or a double jump. My main intention is to make a relatively simple game fueled by a compelling story and quests. By defeating enemies, you receive money and experience points (EXP), which will help you on your journey. The game has a simple levelling system - levelling up partially restores lost health and improves your abilities. A lot of focus went into power ups, which can permanently increase your max health, etc. Lastly, I’d like to mention the ability to put gems into your clothing and necklace, which also affect your power and abilities. I’ve already mentioned the basic mechanics, so now I’ll describe the attacks themselves. In the games, there are only two forms of attack. Your primary attack is a sword, which you’ll have throughout the entire campaign. Nightkeep lacks a classic ‘equip’ option, so there’s really no way for you to let go of it anyway. Luckily, however, it’s not your typical sword, as this one has some sort of magical abilities. Therefore, it can change forms while in battle, depending on what gem is inserted into its handle. The second attack comes in a form of throwing weapons. Because the main character is a huntress, she has all hunting weapons at her disposal (such as throwing knives, axes or the latest invention of the Goblin workshop). That’d be too easy, however, and so every weapon also has its own level, which can be increased (by fulfilling certain tasks). Not only does a higher level increase the weapon’s attributes, but also changes its visual form. Since I like RPG games, and have only made RPG games in the past, this game wouldn’t be complete without many different items you can find. Nightkeep has its items divided into 4 sections - consumables, general, relics and gemstones. The game holds over 60 different items you can come across during your playthrough of the campaign. They can be found in chests, secret rooms or in the corpses of your enemies. For example, slugs can drop Slime Glue, spiders can drop Spider Silk and skeletons can outright lose their head sometimes. For now, the items don’t have much of a use, which I intend to fix soon. Also, some of the rarer monsters can even drop mighty relics! "...In the event of the Calamity, everyone has their purpose, and making a run for it is as good as committing suicide. It's in times like these, when people stay together, that the hunters are a sword and shield. In the world where people learned to live among monsters, everyone has their place. Whether you're a blacksmith or a hunter, you can't live without each other. Just imagine a hunter without a proper weapon, or a blacksmith running out of business. Both would fall into oblivion..."
In the game, players will progress through quests, be it the main quests or side quests. Since you play as Arietta, which loves rewards, it is a matter of course you’ll recieve your fair share or every quest you complete (or will you?). An integral part of this is exploration, so do expect some backtracking (not a lot, though). Last but not least, the world also holds many secret rooms and rare monsters. Bosses are a no-brainer, either those, that stand between you and accomplishing your main quest, or those, that you won’t have to fight. The entire game is basically being done by me - I do all the pixelart, the programming and design of the entire game, including the story. The game has been in the works since 2015 and it’s just a hobby of mine, so I won’t even dare to guess the release date. Recently, I was joined by Thomas J. Peters, who is responsible for the trailer music (https://soundcloud.com/tpcomposer/). If the development goes well, he’ll also be the guy behind the entire Nightkeep soundtrack. As I’m not a native English speaker, the campaign is being translated by Thomas Schmied, who’ll also be translating the finished game. Thomas is a volunteer and without his enthusiasm, I wouldn’t be able to continue. Unfortunately, the Greenlight campaign is a bit rushed, mostly because of Steam Direct, which is the supposed successor to Steam Greenlight. It upsets me quite a bit, as the game was supposed to be unveiled in summer and I also planned for the Greenlight campaign to have a different trailer (the campaign was originally planned differently itself). Thank you very much for any form of support if the game interests you! You can follow me and the development over on Twitter (Twitter.com). Nightkeep is a project I’ve been working on for the past 2 years. My goal is to merge classic metroidvanias and JRPGs, add a fairytale-like theme and make a platformer, which will bring players 20 years into the past. Nightkeep is an action RPG platformer inspired by the SNES-era classics such as Castlevania Bloodlines, Demon’s Crest and a number of JRPGs. I’m a big fan of the stories these games tell. I’m making the game as a nostalgia trip for the fans of old NES/SNES games. It’s always been my biggest dream to make games like these. If the game is successful, I’d love to continue making games and create indie fantasy and rpg games. I’ve got tons of ideas, but they’ll have to wait. After two years, the project is launching on indiegogo looking for support. Also, if you'd like to help me, consider sharing the Indiegogo crowdfunding campaign! I appreciate it. Hi, I am brining few new GIFs from the latest development. Hello, I am releasing gameplay teaser for Nightkeep. 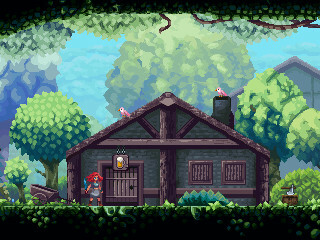 The Game is 2D RPG platformer inspired by Castlevania and old SNES games. Oh I was speaking about demo earlier, right. For gamejolt. I didn't forget about it. I will make one the next weekend.